The Chandipura virus is an emerging tropical pathogen associated with acute encephalitis syndrome (AES) in rural India. This primer discusses the various steps of patient evaluation, mainstay management, empirical treatment and supportive care. The Chandipura virus for over a decade, has been one of the major contributors to the rising number of deaths from acute encephalitis syndrome (AES) in rural India. 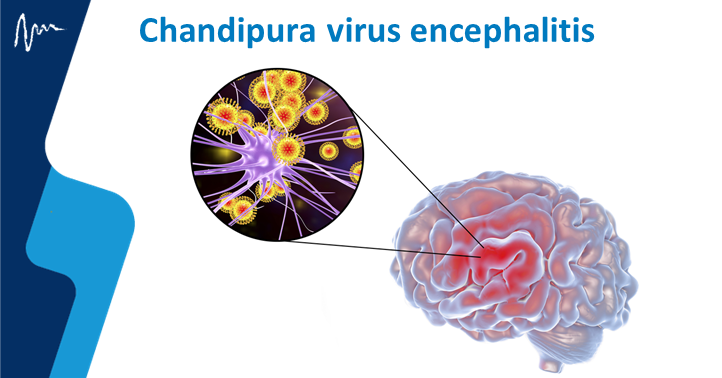 Chandipura Virus (CHPV) is a fatal human pathogen that belongs to the Rhabdoviridae family of viruses which causes explosive outbreaks in rural parts of India, resulting in mainly children manifesting an influenza-like illness with neurological disease. CHPV encephalitis occurs only in children of less than 15 years of age with symptoms of acute onset fever with altered sensorium, seizures or coma. Maharashtra, Madhya Pradesh, and Andhra Pradesh are states that have reported cases of CHPV. In 2003, CHPV was identified to be associated with an outbreak of Acute Encephalitis Syndrome (AES) in 329 young children living in Andhra Pradesh of which 183 were fatal. In 2004, an epidemic was seen in Gujarat in which 78% fatality was experienced. In 2007, Nagpur witnessed an epidemic resulting in more than 40% fatality. In 2010 there were 31 deaths of which 15 were positive for CHPV and in 2011 the number of deaths were 12 with positive CHPV in 3 cases. As with all emergencies, initial treatment should consist of maintaining airway, breathing and circulation (ABC). Initiation of vascular access is the next important step. In cases of circulatory failure, a bolus of 20 ml/kg of normal saline should be given. Blood samples should be taken for different investigations. IV glucose should be given in cases of hypoglycemia. A thorough history about the fever, headache, vomiting, irritability, seizures, and rash should be taken from the patient focusing on their onset and duration. A family history, past medical history, history of drug exposure and trauma should also be obtained. A neurological examination should be done to reveal the level and localisation of brain dysfunction. The Glasgow Coma Scale (GCS) should be used for recording consciousness levels objectively. For infants and children, a modified GCS should be used. To detect for any brainstem dysfunction, the oculocephalic, corneal, cough, gag and oculovestibular reflexes should be checked. Deep tendon reflexes and control of limbs should also be tested. Particular attention should be paid to posturing of the patient, because many times this points to a brainstem herniation syndrome. Subtle seizures should be carefully checked for in patients that have symptoms such as twitching of fingers, mouth, eyelid etc. To check for papilledema and retinal hemorrhages, a fundus examination should be done. Meningeal irritation signs such as neck rigidity, Kernig’s sign and Brudzinski’s sign should also be checked. In emergency cases, only a CT scan may be possible, but it can give some important information such as the presence of bleeding, cerebral edema, temporal lobe hypodensities in herpes simplex encephalitis, thalamic abnormalities in Japanese Encephalitis and basal exudates and hydrocephalus in cases of tubercular meningitis. Other microbiological investigations should be done if the cause is not confirmed. A microbiologist should be consulted when taking samples of urine, nasopharyngeal aspirate, serum (acute, and convalescent after 2 weeks), throat swab, and swab from vesicles or rashes. In children suffering from unexplained encephalitis, HIV testing should be done. ICU admission and treatment is ideal for patients with a GCS of <8, or if they have symptoms or signs of increased intracranial pressure, status epilepticus and shock. While waiting for the results of the investigations, empirical treatment should be started. A broad spectrum antibiotic such as Ceftriaxone should be given, and it can be stopped if confirmation of bacterial meningitis is not found. Consensus recommendations from the expert group suggest Acyclovir for all cases of sporadic viral encephalitis at a dose of 500 mg/m2 be given every 8 hours for children of 3 months to 12 years; whereas for children above 12 years of age, Acyclovir should be given at a dose of 10 mg/kg TID. Maintenance of intravenous fluids to sustain euvolemia and normoglycemia and to avoid hyponatremia should be done. The normal daily requirement of fluids should be given to children suffering from acute viral encephalitis preferably as isotonic fluids. If their intracranial pressure is increased, hypotonic fluids such as 0.18% saline in 5% dextrose should not be given. It is necessary to urgently diagnose and manage raised intracranial pressure. Emergency departments often mistake decerebrate posturing for seizures which they incorrectly treat with anti-epileptic drugs. If the patient has a GCS of less than 8, or irregular respiration and is unable to maintain airway, or there is proof of herniation, the patient should be intubated. Patient should be hyperventilated until a PaCO2 of 30-35 mm Hg is achieved if there are signs of impending herniation. An initial bolus of 0.25 g/kg of mannitol should be given followed by 0.25 g/kg of mannitol every 6 hours as required for 48 hours. In cases of hypotension, hypovolemia, and renal failure, hypertonic (3%) saline is preferred over mannitol. Sufficient amounts of analgesia and sedation should be given to the patient. All noxious stimuli should be kept away from the patient and nebulised lignocaine should be given before endotracheal tube suctioning. Euglycemia should be maintained at all times. Hypoglycemia should be identified and treated with intravenous dextrose first as a bolus dose of 2 mL/kg 10% dextrose, followed by infusion of glucose at a rate of 6–8 mg/kg/min. Monitoring of the blood glucose should be done at regular intervals. Treatment and prevention of seizures entails giving anticonvulsants if the child is having seizures, or has a previous history of seizures. Benzodiazepines such as lorazepam at a dose of 0.1 mg/kg, or diazepam at a dose of 0.3 mg/kg or midazolam at a dose of 0.1 mg/kg should be given, after which phenytoin loading is done at a dose of 20 mg/kg. Other measures may include treating any simultaneous bacterial infection such as pneumonia with suitable antibiotics. Nosocomial infections should be prevented and treated timely since they are complications which the patient can acquire during hospitalisation.